New at LAQ: Imani 2 skin! I remember when the Imani skin first came out at LAQ; I thought the skin was beautiful and ended up wearing it for several days and enjoying the different makeups. I’d felt the skin was perfect as it was, so when I logged in today to a notice about an Imani 2 skin, I was surprised. Anyway, I shrugged off my momentary surprise, went ahead and rezzed the box, unpacked it’s contents to my inventory, and then put on the first skin. And it was love all over again. The Imani 2 skin remains faithful to Imani’s face overall, but various updates have been made that refine her appearance. Probably the very first thing you’ll notice are the lips. The lips are, for the most part, same as the original, but there’s some subtle enhancement to the shine on the lower lip. There’s also some shading along the upper lip that’s new, and there’s a noticeable difference at the “cupid’s bow” section. While I still love the full, pouty look of the lips on the first Imani skin, I’m really happy to see the definition on these new lips. The next thing I noticed were the eyebrows. Imani 2 has essentially the same eyebrows, except they’re a bit more fleshed out and more full. I adjusted my hair base (the system hair worn to create a bald pate) slightly; the first Imani skin has slightly thinner brows and I felt that the level of pointiness and arch of my personal brow shape could be taken down slightly for the new Imani 2 brows. Imani 2 also sports a very subtle beauty mark in the area of the left cheekbone, something that is not present on the first Imani skin. Finally, I also noticed right away that the “glow” or “shine” on this skin has been distributed slightly differently. It’s really amazing to see skin designers work their magic on the avatar mesh with the subtleties of shading and highlighting. I feel as if the face of the Imani 2 skin has an overall slightly softer, more feminine feel to it because of the new glow/shine that Mallory has used on it. I’m not sure which is my favorite skintone for Imani 2; I keep wavering between Ebony (the darkest) and Cocoa (the second darkest). Imani 2 is also available in Nougat and Peach for those who want a lighter version. 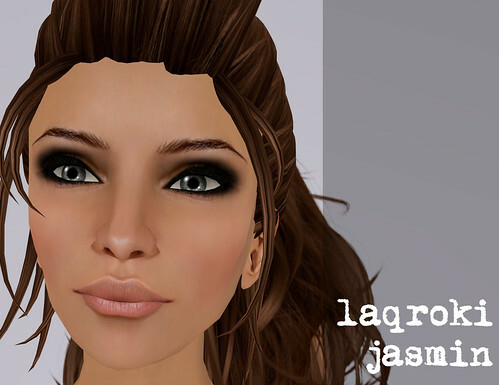 There are ten makeups available for each skintone, and for each makeup there is an optional hairbase (for use with some of the hairstyles at LAQ; using a hairbase skin with one of the hairbase styles results in a nice looking, realistic hairline). You can choose between a heart symbol or an & symbol. To get the initials of your choice, just pick up the order form from the vendor at Caroline’s Jewelry and follow the simple instructions. I think this would make a really cute Valentine’s gift, which happens to be right around the corner! [17:30] Sun Marseille: why did you eject me? [17:37] Sun Marseille: how do you know what skin im wearing and who are you to boot me without asking me first? [17:40] Sun Marseille: are you nuts?? [17:49] Nadja Baxter: ask to hwher you bought this skin ? [17:50] Nadja Baxter: no answer ? [17:54] Nadja Baxter: so where you bought this skin? [17:56] Sun Marseille: little late to ask me now.. isnt it? [17:57] Nadja Baxter: but whre you buy this shin ? 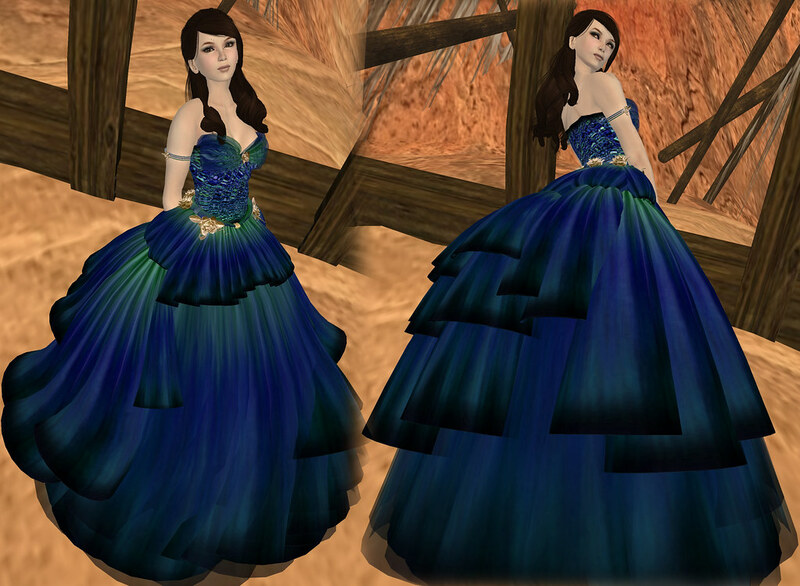 The skin in question was bought from Le Mode ( http://slurl.com/secondlife/Turnip/56/144/3001 ), created by Milla Crystal. When contacted, Nadja Baxter declined to comment. [18:12] Nadja Baxter: so i apology. Even with the apology, this sort of behaviour on the part of an event organiser is extremely questionable, in my opinion; one hopes that she won’t be quite so precipitous in the future. 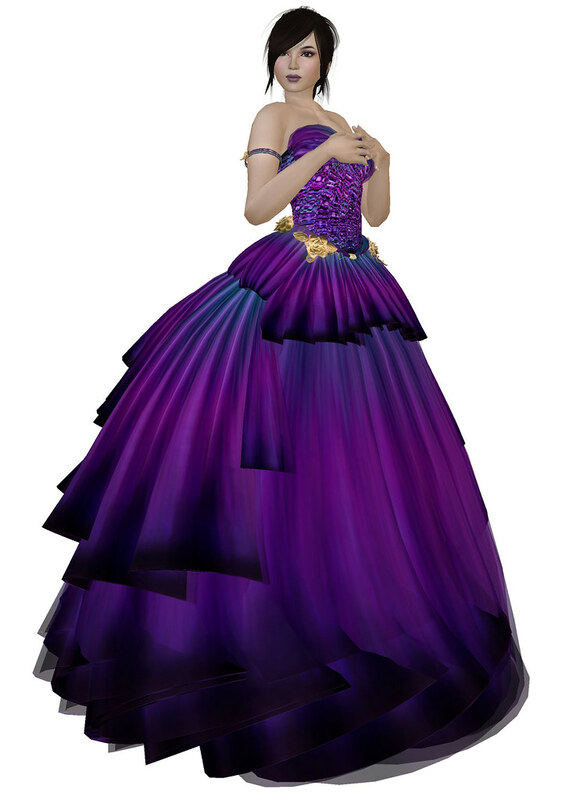 One of my friends Brianna Stenvaag and her partner Mogan Bezner are the designers behind the store Le Pinceau, and they recently released a new skin named Penelope. Prior to this Brianna has released an asian skin called Mei Mei that’s really cute, as well as another skin named Frida, but I think Penelope is my favorite from her so far! Brianna and Mogan also offer some very beautiful eyes; I always admire them on Brianna whenever I see her. They’ve got a whole bunch of colors and so I’ve decided to show just my favorites here, but there’s a lot more you can choose from when you visit the shop. 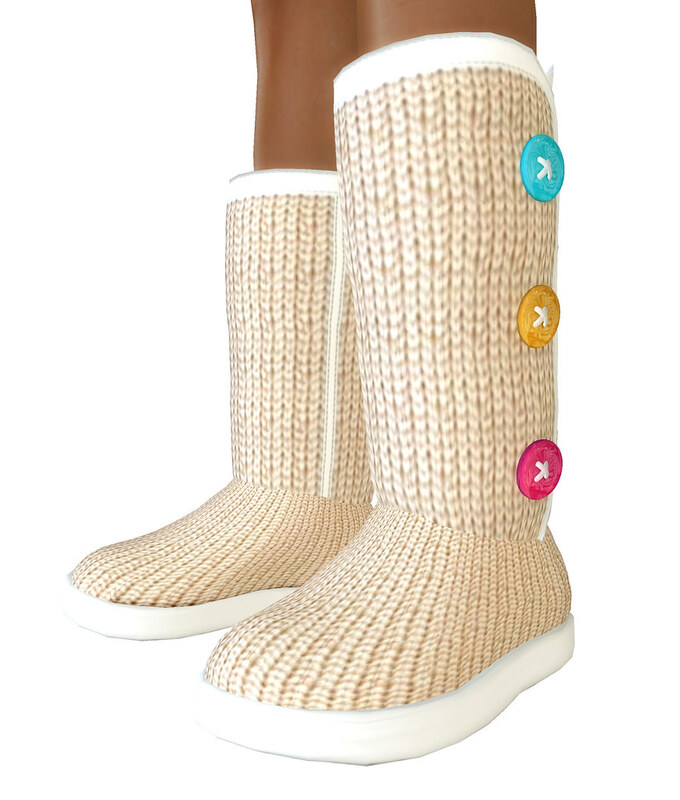 new skins at laqroki — word up to my azn grrlz! 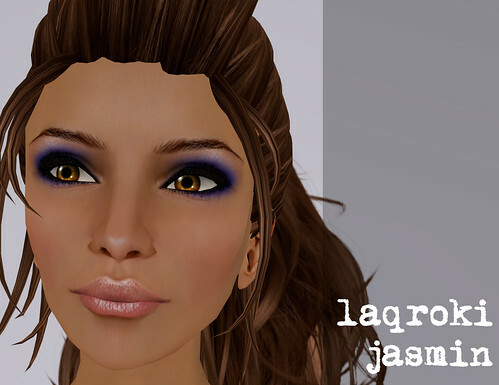 Laqroki re-opens it’s doors today at 11:00 A.M. SLT, and is launching an all-new line of skins! The new Renaissance Collection is being introduced with four new female faces — Suzu, Clara, Jasmin, and Emily — and boasts a beautiful new body-skin to go with them. Each face comes with lots of options, from a variety of makeups to multiple skintone choices, making it easier for you to customize the exact look you want. I’ve mentioned this several times in the past, but I’m ever on the lookout for skins that befit my own RL ethnicity (mostly Asian, some Spanish), and my jaw nearly hit the floor when I saw the new Suzu skin. Mallory Cowen has moved beyond the usual lighter-skinned collection of skintones for this Asian-influenced face, and has made it available also in darker tones (nougat, golden tan, cocoa) that would befit someone of a Southeast Asian heritage. Click the images to see larger versions at my flickr stream. No post-processing was done other than cropping and adding text. Visit Laqroki today to try the demos!